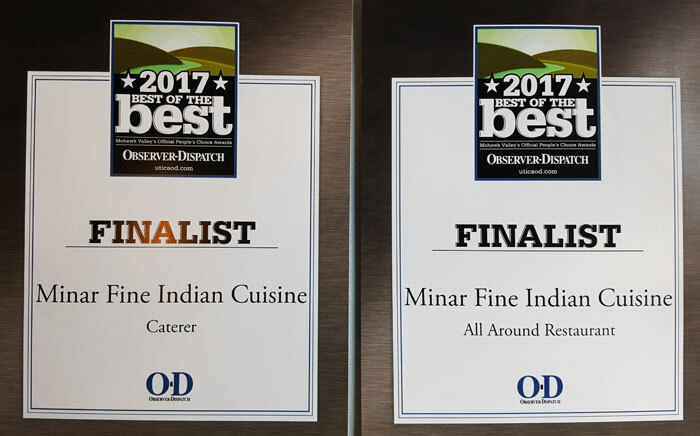 Voted “Best of the Best” for Fine Indian Cuisine “Catering” and “All Around Restaurant.” Thank you! My roommate and I came here for the lunch buffet. The price is great and the waiter gave us a dollar off student discount. This place has a larger variety compared to other Indian restaurants. The Naan bread was nice and hot! 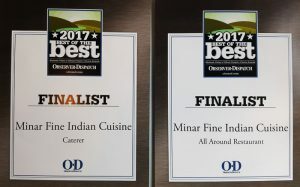 Minar Fine Indian Cuisine is clean and the service is great. We heard great things now we experienced it. What a great restaurant. We went for the lunch buffet to get more familiar with the food, all I can say is delicious, service very good and the Naan is so delicious and served warm. Fantastic dining experience at Minar. The Malai Kofta was delectable, and the owner, Raj, was great. I can’t wait to try his Syracuse restaurants. We will also return here whenever we are in the Mohawk Valley. Always amazing service at Minar Fine Indian Cuisine. The quality of the food has me returning again and again! This area is lucky to have this restaurant!